Is the health information credible/informative? Is the health information provided complete? Is anything of significance to the reader missing? Is there a clear focus on the targeted health behavior(s)? Is the information appropriate for the target audience? Are any technical terms clearly explained? Does the content minimize any confusion about the health information subject? Is the information new and/or relevant to the reader? Is the material’s length, style and content appropriate for the target audience? Do the visuals/graphics support the material’s content? Are the visuals relevant to the target audience? Is the reading level appropriate for the target audience? Is the health information message(s) clear and consistent? Are the main points stressed and repeated? 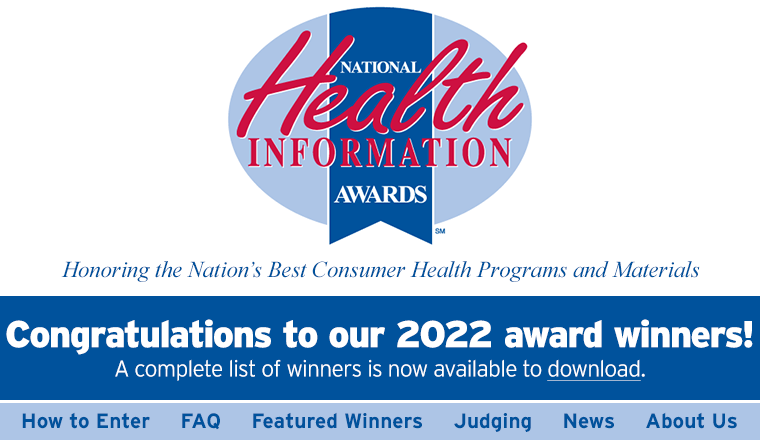 Every year, the Health Information Resource Center™ seeks qualified individuals to serve as one of our 20+ judges that review entries for the National Health Information Awards. If you are interested in judging this year's competition, please complete the judging application form. We will contact you quickly upon receipt of this application.